This keyword will copy the text from clipboard and paste it on an EditBox object. It takes an EditBox object as Object input argument. This keyword is mostly used in situations where you want to copy any text from the clipboard and paste it on the EditBox. Note: Sikuli Specific keywords works on the image and tolerance property of the object and are used for image based testing. This Keyword takes EditBox object as Object input argument. You can choose the EditBox object from your Object Repository on which you want to Paste Text from Clipboard. This keyword will copy the text from clipboard and paste it on an Editbox object. Fetch the Edit Box Object “Username” and then capture its image by clicking on the icon. Save the Image property of the object and set its Tolerance Property. Check the Is Used checkbox only for Image and Tolerance property. Note: You can also fetch objects by adding them manually. Open Notepad [clipboard] and write the content which you wish to copy on the edit box object. Press Ctrl + C and run the keyword. A step could not be executed because one or more of the arguments have not been provided a value. Of all the arguments a keyword accepts, some arguments might be compulsory. As opposed to the non-compulsory ones, the compulsory argument must be provided some data. The data may be provided through one of many sources like statically entering, output of a previous step, a global variable etc. ; but it must not be left blank. Data not provided for argument: ‘ImageObject’. Expected StaticValue was empty. This keyword will drag the first object onto the second object. It takes two objects as Object Input arguments. This Keyword takes two objects as Object input argument. You can choose any two objects from your Object Repository. The first object will get selected and will be dragged and will get dropped on to the second object. This keyword will double click on the specified object. It takes one object as Object Input arguments. It does not take any data Input Argument. This Keyword takes one object as Object input argument. You can choose an object from your Object Repository on which you want to double click. This keyword does not require any Data Input Argument. This keyword will find the ReferenceImage on the screen after trying (many) up-scaled versions of the ReferenceImage. This helps in scenarios when the zoom(or resolution) level of the AUT has changed from the original OR Object. This keyword also remembers the scaling-factor and applies it to all further keywords of the same session until the ResetImageScaleFactor keyword is called. This keyword returns the scaling factor of the source Image wrt the Screen Image. It takes one image object as Object Input arguments. It does not take any data Input Argument. This Keyword takes one image object as Object input argument. This keyword will find the highlighted image on the screen after trying up-scaled versions. Suppose you have to run this keyword on Chrome where you have Zoomed the screen from 100% to 110%. In this case, SetImageUpScaleFactor keyword will up-scale the image 10% in order to match the object. Data not provided for argument: ‘ReferenceImage’. Expected StaticValue was empty. This keyword will wait for the specified time till the specified object appears on the screen. It takes one object as Object Input arguments. It also takes TimeOutInSeconds as data Input Argument. This Keyword takes one object as Object input argument. Suppose object Obj1 appears on the screen after hovering the mouse over the highlighted object [wrt to the screenshot below] . This keyword will wait for 10 seconds till the object Obj1 appears on the screen. This keyword will wait for the specified time till the specified object disappears on the screen. It takes one object as Object Input arguments. It also takes TimeOutInSeconds as data Input Argument. Suppose object Obj1 disappears on the screen after hovering the mouse over the highlighted object [wrt to the screenshot below] . This keyword will wait for 10 seconds till the object Obj1 disappears on the screen. This keyword will find the ReferenceImage on the screen after trying (many) Down-scaled versions of the ReferenceImage. This helps in scenarios when the zoom(or resolution) level of the AUT has changed from the original OR Object. This keyword also remembers the scaling-factor and applies it to all further keywords of the same session until the ResetImageScaleFactor keyword is called. This keyword returns the scaling factor of the sourceImage wrt the Screen Image. This keyword will find the highlighted image on the screen after trying down-scaled versions. Suppose you have to run this keyword on Chrome where you have Zoomed the screen from 100% to 80%. In this case, SetImageDownScaleFactor keyword will Down-scale the image 10% in order to match the object. This keyword will right click on the specified object. It takes one object as Object Input arguments. It does not take any data Input Argument. This Keyword takes one object as Object input argument. You can choose an object from your Object Repository on which you want to Right click. This keyword will click on the specified object. It takes one object as Object Input arguments. It does not take any data Input Argument. This Keyword takes one object as Object input argument. You can choose an object from your Object Repository on which you want to click. This keyword will Reset the Image Scale Factor to 1.0. It does not take any Object or data Input Argument. This keyword will Reset the Image Scale Factor to 1.0. Suppose you have to run this keyword SetImageDownScaleFactor on Chrome where you have Zoomed Out the screen from 100% to 80%. In this case, If you want Reset the image back to original, then here is you can use ReSetImageScaleFactor keyword which will Reset the Image Scale Factor to 1.0. There are no error conditions for this keyword. This keyword will hover the mouse on the specified object. It takes one object as Object Input arguments. It does not take any data Input Argument. This Keyword takes one object as Object input argument. You can choose an object from your Object Repository on which you want to hover the mouse. This keyword will Type the specified text on an Editbox object. It takes an Editbox object as Object input argument and Text to be typed as Data Input Argument. This keyword takes Text to be typed as Data Input Argument. This keyword will type the text on an Editbox object. This keyword shall try to compare the two image objects and return True if either of the image is found similar to the other one. It takes two image objects as Object Input arguments. This Keyword takes two image objects as Object input argument. If the two images are not matched with each other. This keyword will verifies the existence of an object through an image. It takes one object as Object Input arguments. If an object which exists on web is provided without using Open Browser keyword. This keyword will compare the two images and return True if either of the image is found on the other one. This Keyword does not take any Object input argument. Specify the path of the image. You can compare two images at a time. 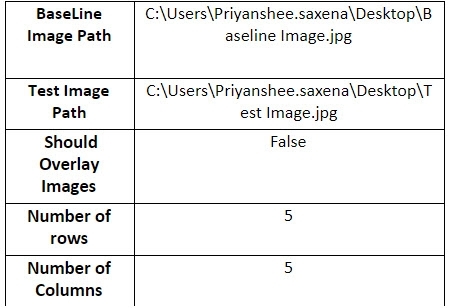 Note: Image paths of two images are given. when blank data input arguments are provided. This keyword will return the number of matching objects on the screen. It takes one object as Object Input arguments. This keyword will apply OCR [optical character recognition] techniques to read Text from the specified Image. It takes Image Path as Data Input arguments. Specify the Image Path whose Text has to be fetched. This keyword will fetch the Text of the given image. Note: The image should be in the jpg format. This keyword will splits two image into multiple small Images, compares each small Image and check for the mismatches based on the Object and Data Input Arguments provided. This Keyword takes two Objects as the Object Input argument. Specify whether or not the Output image should be Overlayed on the baseline image or kept side by side. It is a checkbox which should be checked for True condition and unchecked for False Condition. If no Object Input Arguments are provided. If Blank Data Input Arguments are provided. Data not provided for argument: ‘BaselineImage’. Expected StaticValue was empty. This keyword will splits two images into multiple small Images, compares each small Image and check for the mismatches based on the Object and Data Input Arguments provided. This Keyword does not require any Objects as the Object Input argument. Baseline Image Path Not found. This keyword will apply OCR [optical character recognition] techniques to read Text from the specified coordinates of the Screen based on the Data Input Arguments provided. If Invalid Data Input Arguments are provided. Argument(s) X; Y; Width;Height is/are Invalid. This keyword will find a matching object through an image on the screen. It takes one object as Object Input arguments. This Keyword does not take any Data input argument. This keyword will find a matching object through an image on the screen. This keyword will apply OCR [optical character recognition] techniques to read Text from the whole Screen. It does not take any Data or Object Input arguments. This keyword will apply OCR [optical character recognition] techniques to read Text from the specified Image. It takes an Image Object as Object Input arguments. The Tolerance Property of the Selected Image Object is set as 0.7 so that the Text of the image can be easily read. The image should be in the jpg format. No object could be located on the currently active page/view with the matching text. This happens mostly when the page is not properly loaded or the view is not properly rendered. It might happen with a misspelled argument to the keyword. If no Object is provided.